In this week’s blog post, Tom shared great tips for crafting good drag & drop interactions. That post must have ignited a lot of ideas because we were delightfully inundated with drag-and-drop questions this week at Learning Technologies in London. This fun example demonstrates a novel way to use drag-and-drop to reveal hidden objects or messages. 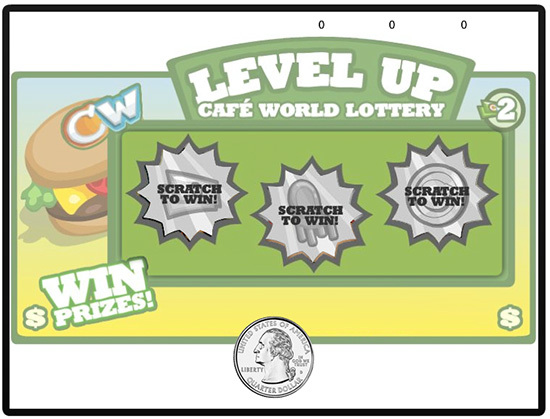 Modeled after a scratch-and-win lottery ticket, this drag-and-drop interaction leans on Storyline’s variables to count the number of times the quarter is dragged over an object. 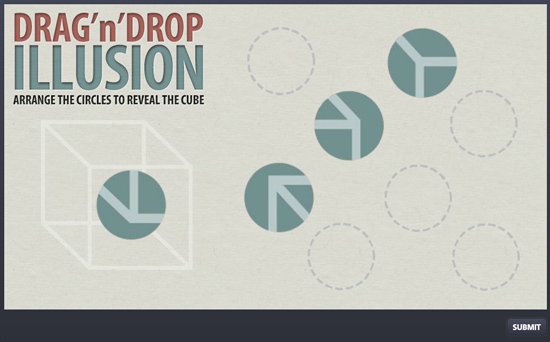 Using multiple objects, learners drag objects to complete an optical illusion puzzle. How can this type of game be applied to procedural training? 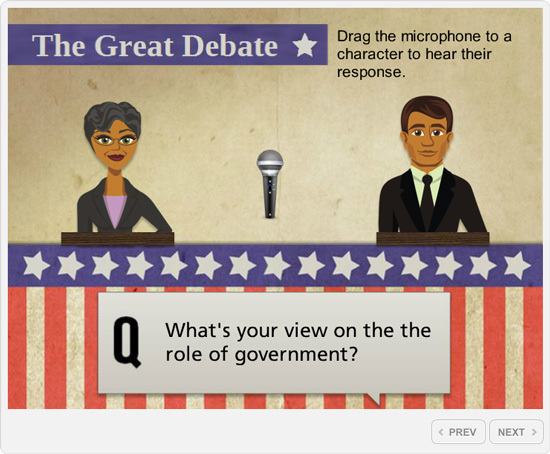 In this example, learners are asked to drag the microphone to each candidate to hear a response. This week your challenge is to build a drag-and-drop interaction based on one of the three examples above. Don’t have time to put an activity together? No problem. Just share some ideas for ways to use drag-and-drop in non-quizzing activities. We’ll pull the ideas together and use them for a future challenge! Jackie Van Nice shared a creative idea for incorporating the NEXTCHA button into an audit course. Be sure to check out Jackie’s blog post that describes how she built her project. Great job, Jackie! Montse Anderson followed up with a creative use for interactive text fields in compliance courses. Jeff Kortenbosch asked learners to think quickly in this time-based version of NEXTCHA. Paul Alders shared his own icon-based version of NEXTCHA in this creative demo. Be sure to check out Paul's website to download his source files! Hope your week is drag-and-drop-tastic, E-Learning Heroes! David asked me this week why I hadn't entered and I didn't have a good answer. I looked through what I had done in the past and came up with this one http://www.test.elearninglaboratory.co.uk/game4/story.html This was one of the first things I built as part of the original Storyline beta, but there is a novel use of drag and drop in there. I thought I would post another example http://www.test.elearninglaboratory.co.uk/Moon/story.html This the very first thing I built during the first SL beta, surprised it has stood the test of time. Nice, Phil! At first I got fired, but then I rallied. Really well-integrated execution. Thanks for sharing! Nice Phil, love the video at the beginning with the birds etc. As a member of the Mars Society, I loved the theme of your game as well. Another "blast" from the past... Thanks for resurrecting‎ that one, Phil. I know this is from January. I just posted a question in the forum in regards to having an object snap back to the original hotspot. Question is here: http://community.articulate.com/forums/t/54900.aspx How did you get the microphone in the Great Debate to snap back? Is there only one hotspot? Or three? One for each person and one for the reset? Thank you! Well it might not be brand new, but it's a good (and adorable) drag-and-drop! I was thinking the same thing - that it might be a good idea to post certain examples to past challenge threads in case it helps someone looking for a particular solution. I don't mind you sharing a pre-owned drag-and-drop. It's a very cool interaction and that's all that matters. Like Jackie, the new-drag-drop smell is nice, but sometimes it's enough to get from Drag A to Drop B. Fantastic, Dianne! That was clearly a lot of work, but it turned out beautifully. Thanks so much, Jeff and Jackie!!! Hey gang, I'm moving the recap for this challenge to our new format. I'll have it posted in a few weeks. Thanks David but don't forget to have a weekend break too! Hey everyone! 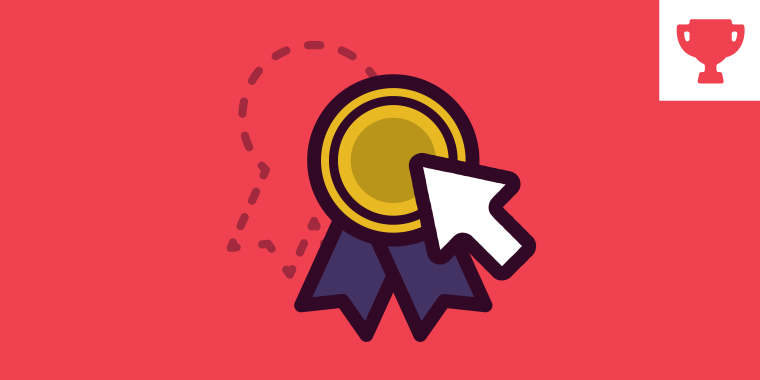 Just letting you know the recap for this week's challenge is current: https://community.articulate.com/articles/drag-drop-elearning-examples/ I had to remove a number of entries due to broken links (Dropbox, Google Drive, etc). If you shared an example and it's not posted, please re-post your link in the comments so I can add it. Very nicely done Chris. I'm assuming that you made a dark gray rectangle, removed a hole and feathered the edges and that you have that as your dragged item. Ingenious.